Browse: Home / oilsands / Refine it where you mine it? The question of what, if anything, Alberta should do to encourage more upgrading or refining in the province will be an important one regardless of which party wins the election on Monday. This question is pressing as, within the next decade, the province expects to receive about 300,000 barrels per day in bitumen as royalty payments (PDF), and to date have signed a single agreement to process (PDF) for 37,500 barrels per day, with Northwest Upgrading (NWU). Should the bitumen be provided below market prices to local refiners? Alternatively, as in the NWU deal, should the province contract with merchant upgraders and/or refiners to process the bitumen? If so, should we only consider refineries located in Alberta, or should we be prepared to look more broadly? Or should Alberta simply market the bitumen to the highest bidder? Discounting bitumen for local processing seems unlikely to survive a NAFTA challenge, so I think that’s off the table. Clearly, the option to sign commercial processing agreements is on the table, but I remain unconvinced that it should be. I think it’s imperative that, if we are going to sign a contract for processing, we look as broadly as we can – cheaper processing makes our bitumen resources more valuable, so we should take advantage of that if we can. Can we increase the value of the oilsands resource through more vertical integration? There is no question that, over the past decade, Alberta resources have frequently traded at significant discounts to world prices due to infrastructure constraints. The figure below shows that, on average, the expected gross refinery margin for a bitumen refinery in Alberta would have been approximately $34/bbl – certainly a large enough spread to have been profitable over that period. The difference between the value of 3.42 barrels of bitumen and an approximate refinery output of 2 barrels of gasoline (US Gulf Coast) and 1 barrel of low-sulphur diesel (LA). A feed rate of 3.42 rather than the traditional 3 is used to approximate for a 14% loss of the bitumen feed via buried coke. how much is it likely to cost to build the refinery? how much is it likely to cost to operate it? how are the prices of gasoline, diesel, and jet fuel likely to behave relative to the value of bitumen in Alberta? The difference between the value of 3 barrels of Brent (light) or 3.18 barrels of Maya (heavy) crude and an approximate refinery output of 2 barrels of gasoline (US Gulf Coast) and 1 barrel of low-sulphur diesel (LA). I’ve written at length about the first two questions here and here, so that leaves the issue of the long-term spread. A good benchmark for a long-run refinery spread would include tidewater-traded crude with open-market gasoline and diesel blends. In the figure above, you see the approximate gross refinery margins based on Brent (light) and Maya (heavy) crude prices (I have accounted for 6% loss in the Maya feed due to coking). Based on these assumptions, gross margins have increased only slightly over time, while the heavy-light differentials have increased significantly as global heavy crude has been devalued more in recent periods due to refinery capacity constraints. The average spreads over the time period have been $15.04/bbl on heavy and $9.55/bbl on light. 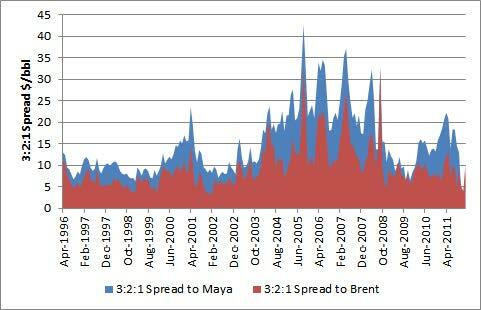 Importantly, the spreads are not as counter-cyclical as those who tout refining as a hedge might suggest. If there is money to be made in refining heavy crude, and the above figure suggests there is, then refineries should and will be built and/or retrofitted to be able to do so. The long-run spread will reflect the cost of the least expensive refinery capacity which can be added to the global system and still make a reasonable risk-adjusted rate-of-return. Alberta is unlikely to be the cheapest location in which to add capacity. For example, Reliance claims to have built their 1.2 million barrel per day Jamnagar complex for about $10,000 per barrel per day of capacity, while we’re seeing estimates for refinery construction in Alberta at approximately 5x that much, at $50,000 per barrel per day of capacity. Capital costs matter – to recover a 15% rate of return on invested capital, a refinery built for $50,000 per flowing barrel would need to recover $13.62 per barrel over-and-above operating and sustaining capital costs for 35 years. * In other words, unless operating and sustaining capital costs are less than $1/bbl, spreads would have to increase significantly over time to make money at those capital costs. This seems unlikely if competing refiners have a $6-10/bbl capital cost advantage – more lower cost refiners will enter the market if the spread is large enough to make the Alberta refinery profitable. Based on the questions asked at the beginning, I still believe that the first-best solution is to make sure our resources can be sold on global markets, to the highest bidder. If that’s true, then cheaper refinery capacity built anywhere will decrease refinery margins and increase the value of our bitumen, all else equal. The second-best option, if Alberta values the hedge provided through vertical integration, is to build refinery capacity wherever it’s cheapest to do so, and thus earn the maximum value and thus the most valuable hedge for our effort. Each of these options allow Albertans to profit from the potential for other countries to process our bitumen cheaply. The third option, building refineries here, should only be considered if it can be shown that they can compete with the other two in terms of delivering value for Albertans – otherwise, we’ll be subsidizing employment by paying more for refining, increasing costs for other oil extraction in the province and thus eroding royalty and tax revenues, and we’ll likely lose money on the spread doing so in the long run. Through my research into this, it seems to boils down to this: if we’re going to continue to be infrastructure-constrained, more refining makes sense in Alberta because we can profit from the Alberta discount. If we expect to be able to access world prices for our oil, let’s make sure we can leverage the cheapest refinery capacity anywhere in the world to enhance the value of our resources. We hear a lot of exactly the opposite – we should elect not to build pipelines to enable upgrading – but let’s remember this is imposing an artificial discount on our resources to subsidize refining, not creating jobs at no cost. * Assumed a 70:30 debt:equity spread and a 7% cost of debt over the 35 year horizon. If we expect to be able to access world prices for our oil, let’s make sure we can leverage the cheapest refinery capacity anywhere in the world to enhance the value of our resources. Once the oil is sold to foreign interests it’s no longer “our” resources and we don’t get any value from its enhancement. Yes, that is exactly what I said. I also said the amount they will be willing to pay for it depends on their refining costs and the value of gasoline. If they can do it cheaper than us, they’ll be willing to pay that much more for the bitumen. They’re not going to pay us more than world mkt price for gasoline/diesel because we put more resources into refining it for them. I’d bet a progressive such as yourself can think of a lot of uses for gov’t money other than refining oil for someone who can refine it cheaper than we can. But, as always, thabks for dismissing my posts. I fail to see the connection between refining costs and the value we’d receive for the bitumen. The market rate is the same whether it’s sold to a refinery in China or Alberta. Why don’t you tell me how you think the market price for bitumen will be determined. That might be more productive. Like any commodity, the market price for bitumen is determined by the commodities markets where many imbeciles bid the price up or down based on, more often than not, highly specious information regarding future supply and demand. Between this and likely Aboriginal challenges, more consideration of east-flowing and/or upgrading options would seem prudent. Also, NDP well positioned for next spring’s BC election. Yes. It would be nice for Albertans to not have to subsidize the mainline (through higher gas prices), so getting oil shippers to pay the tab should have its benefits; however, I have not thought about what sort of costs that Albertans would incur if this overhaul happened.